Return from Texas · · PAGE 413. June 3, 2017: Today was my final day in Texas after the Graduation on June 1, and the birthday party / graduation party at my son's house in Round Rock. When I boarded my flight from Austin to Atlanta, I pulled out my phone with the maps for tracking the flight to Atlanta using the GPS in the phone. I did not have an APP to save the ground track, but I did observe the route and managed to "connect the dots" of the flight using aviation waypoints on my Garmin GPS 296 when I got home. 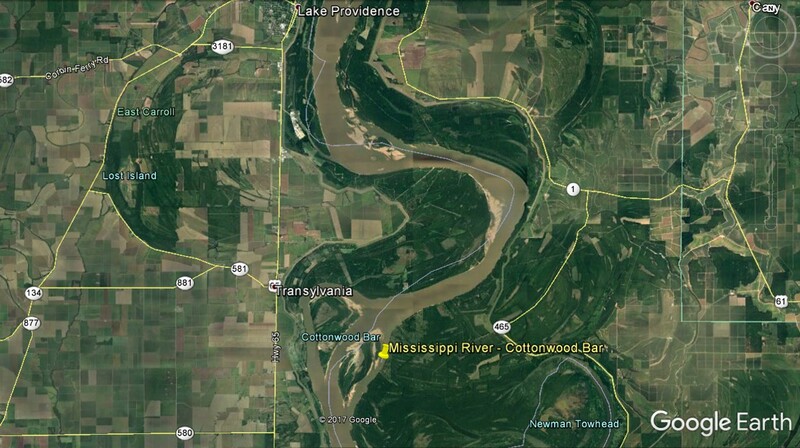 Here is the only outside photo I snapped when crossing the Mississippi River looking at Cottonwood Bar not far from Transylvania, Louisiana. 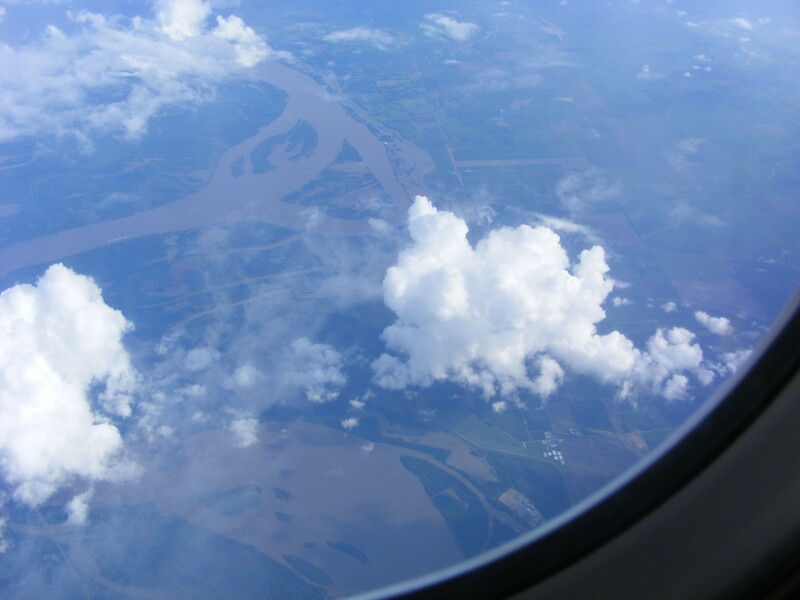 This view is from the right side of the airplane looking south. Here is the Google Earth image of this area looking SOUTH much like I was seeing the area when I flew over in the Delta Air Lines flight from Austin to Atlanta. 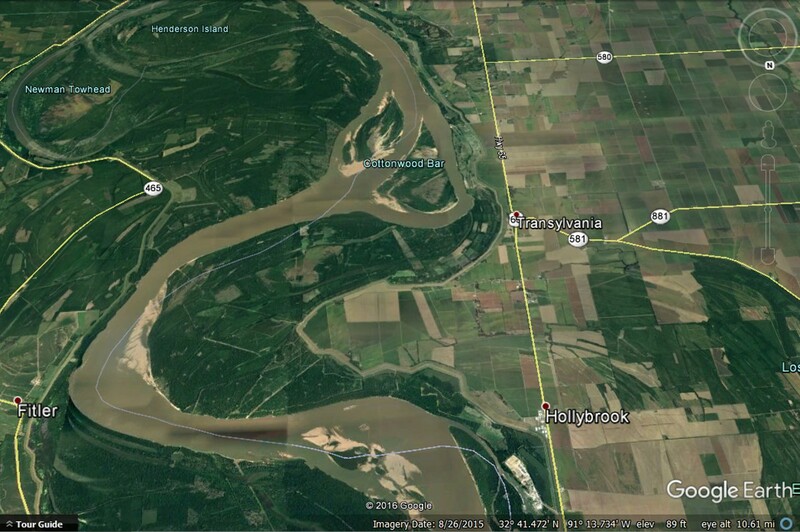 US 65 is running north/south on the west side of the river in Louisiana. Here is the same area showing NORTH UP like a map. Here is the route after I created waypoints on my GPS and entered those waypoints in Google Earth to create the red line seen here. 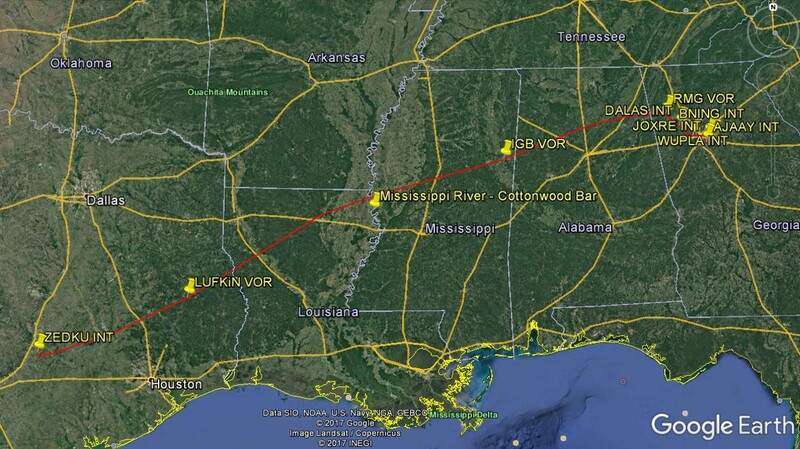 Here is an approximation of the DALAS Arrival which begins near Dallas, Georgia. I used to listen to Atlanta Center talking to airline flights heading to Atlanta from the northwest and Midwest cities, from my house in East Ridge, Tennessee. 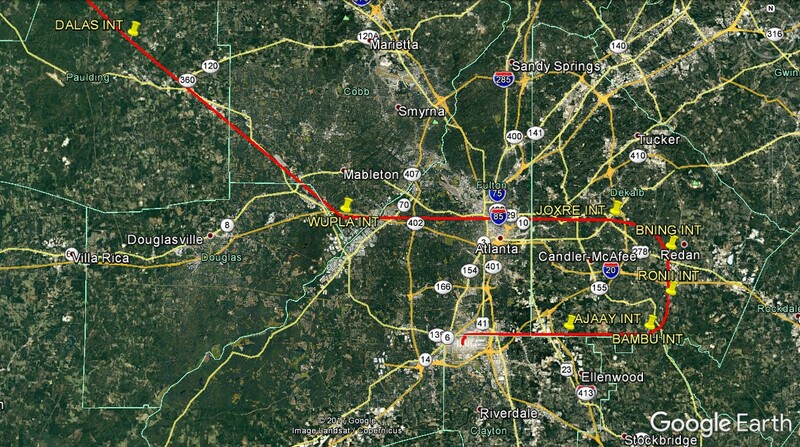 They were all routed via ROME VOR and DALAS intersection before contacting Atlanta Class B approach controllers. My evening meal in the Atlanta airport was small and quick while changing planes in Atlanta. Instead of a sausage biscuit, it was a waffle sandwich with a sausage patty and egg. It was good. The flight to Melbourne departed on time with an on time arrival at MLB. There was one thing of interest when I was waiting to board my flight in Austin going to Atlanta. A lady sitting across from me at the gate has one the "49 faces" that looked like someone famous. She looked very much like the actress in the CBS television show "Madam Secretary", Téa Leoni. This lady was from Virginia making a connection via Atlanta. 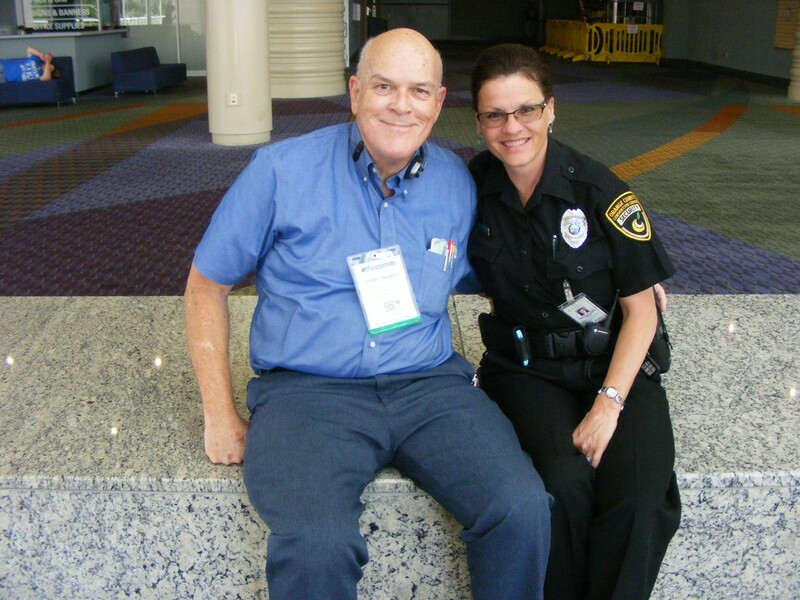 June 14, 2017: This Wednesday and Thursday I attended a trade show at the Orange County Convention Center in Orlando. The ride from my house to the convention center is just under 70 miles in my old Caddy. 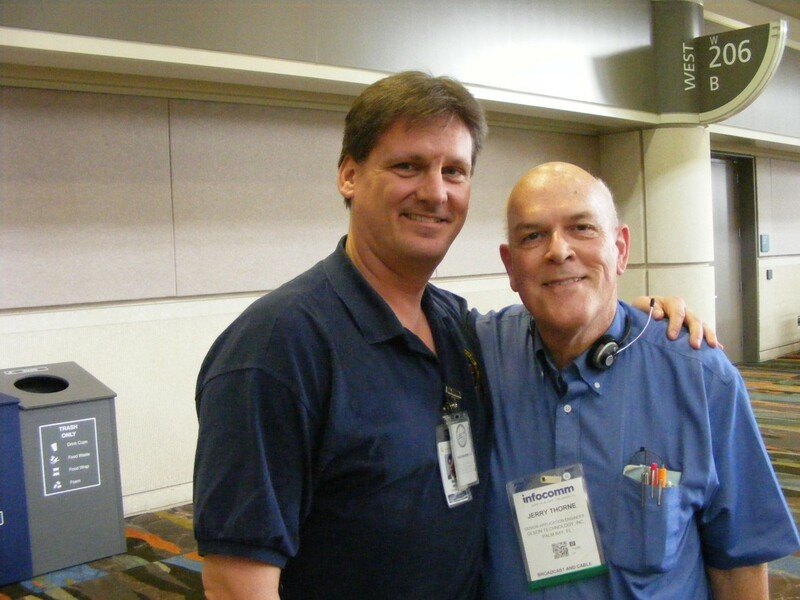 I always work with sales people from our largest stocking distributor at these trade shows. 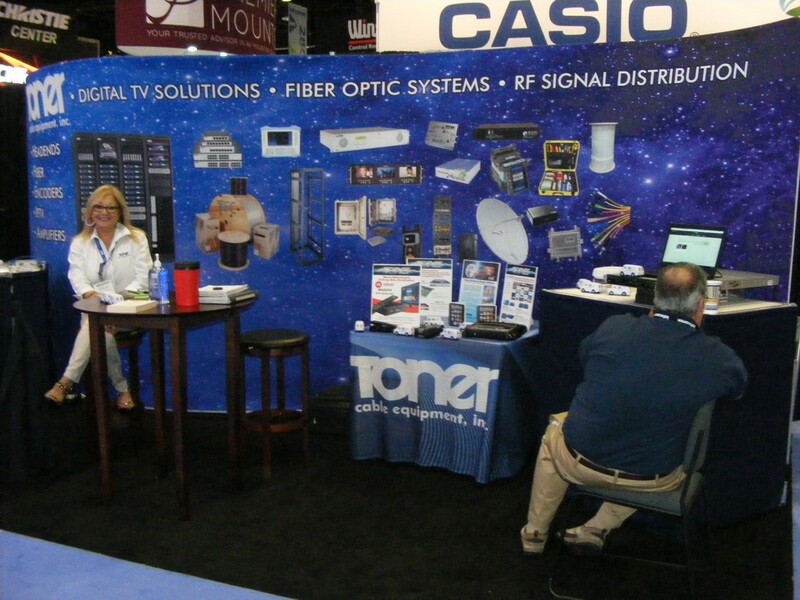 Here is a picture of their 10-foot by 20-foot booth which was also used at a trade show in Denver a couple of years ago. 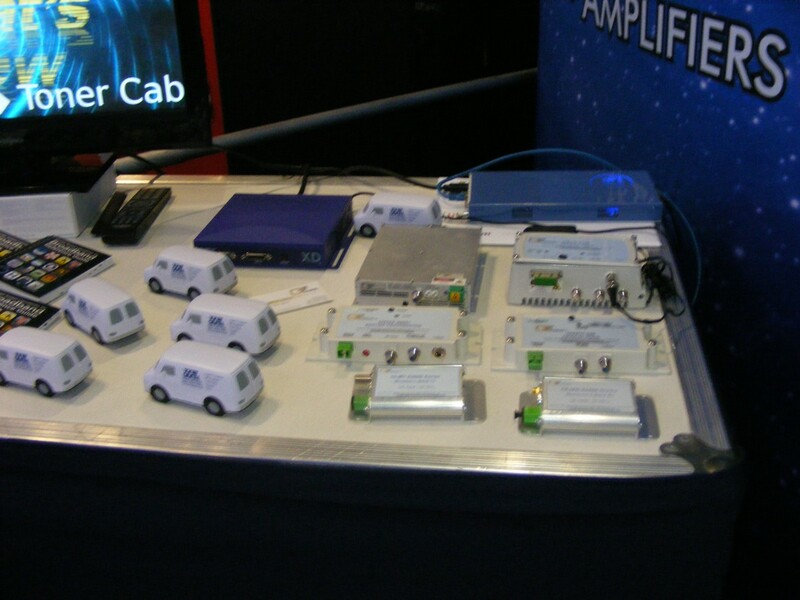 I had a few popular items that fit in my computer bag displayed on a small table at one end of the booth. Those foam trucks from Toner cable are stress relievers to squeeze as needed. They have advertising on them of course to be given away at these shows. The exhibits were open for three days starting on Wednesday. I worked the first two days as the last day is usually a slow day with less customers. June 15, 2017: On this date in 2011, I survived a cardiac arrest with the help of Barbarajean Garcia seen here with me again in these pages. Her name has been corrected from my first posting. There is no space after Barbara as seen earlier. She showed me her driver's license and her new name tag on her uniform. She was born and raised in Brooklyn. She also introduced me to medic Nick Sirny who was a key member of the rescue team that worked on me six years ago on this date. I also learned some additional details of the event from that day. I told them of my memories that began in the ambulance outside the convention center and the highlights of that afternoon and the surgery on June 18.